Get ‘Insomnia No More’ eBook if you want to know how to cure insomnia for good. Insomnia and sleep apnea are two common sleep disorders that up to this time was believed to be independent of each other. While this may be true for some individuals, there is increasing evidence linking obstructive sleep apnea and insomnia with each other. Is there a link between insomnia and obstructive sleep apnea? 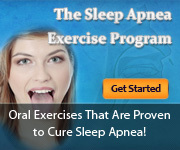 Research shows that anywhere between 39 to 58% of patients with obstructive sleep apnea also have insomnia. And that about 43% of adults who suffer from chronic insomnia were discovered to have undiagnosed sleep apnea. These figures show that both of these conditions can co-exist with each other, but very few studies have been made to determine if one condition causes the other. If so, how are the two linked? Sleep apnea causes secondary chronic insomnia, as a result of the breathing pauses an individual experiences during an apneic episode. When a person awakens every time they try to catch their breath, they might have difficulty in falling back asleep. If this scenario happens every night, then the patient may develop insomnia over time. Interested in learning more about how to cure insomnia? Please click here to get your copy of “Insomnia No More: Say Goodbye to Sleepless Nights”.